While most of the rest of the nation is wondering where all their snow is, Denver certainly doesn’t have to worry about that! A Perfect example was the recent holiday snowstorm that forced the cancellation of dozens of flights one of the busiest travel days of the year. If you live in Denver then you need to be used to living with the snow. This makes everyone well versed in the fine art of snow shoveling. It’s also not unusual to see folks getting around the neighborhoods on skis after snowstorm. As for the kids, there is no more welcome sign that white flurries falling from the sky. Just as most residents of Denver know how to manage the snow on the outside they also know how to keep warm and cozy on the inside. Nothing beats a crackling fire on a cold winter night. If you find yourself stuck indoors during the day while the snow is piled up outside that could be a perfect excuse to take inventory of all the junk and clutter around the house. In this case, the “junk”and “clutter” would be all of those things you would like to get rid of. While it is true that some service businesses are greatly hampered by snowstorm that doesn’t mean you can’t schedule appointments for the first clearing. One of those appointments could be with a professional Denver Junk Hauling crew – Junk King Denver. In the time it takes to the streets to be plowed and these efficient junk haulers to show up you could have already taken a complete inventory of all the junk you want to toss out. A popular approach is using Post-it notes to designate which items you want removed. Imagine going through every room, every closet, your basement, the attic and garage armed with a stack of Post-it notes. Anything you see that you want gotten rid of just slap a note onto it. When the Junk King hauling crew shows up you all you’ll have to do is tell them “everything with a note goes out the door.” Then stand by and watch as a stream of your junk flows through the home and into the back of a truck. You can also apply this same level of comprehensive cleanup to your business. Once again Post-it notes will prove to be an invaluable tool. Slap them on any item in your office that needs to be carted away and let the professional junk hauling crew handle the rest. Working withJunk King’s professional junk hauling crew means you’ll be able to depend on these workers to get the job done right. This is how these folks make their living and their reputation depends upon being responsible and respectful to your home or business. These workers are also dependable in the sense that they are license and insured. Those are really the only kind of workers in the inviting into your home or business. Before you know it the snow will melt, spring will arrive at you’ll have a home free of junk! For the best in Denver Junk Hauling, simply call 1-888-888-JUNK or book a free on site estimate online and save $30 today. 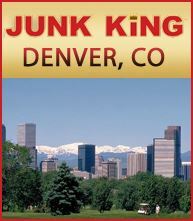 This entry was posted in Clear Clutter Denver, Denver Junk Hauling, Denver Junk Removal, Junk King Denver and tagged Clear Clutter Denver, Denver Junk Hauling, Get Rid of Junk Denver, Junk King Denver, Junk Removal Denver on December 30, 2011 by Paul Durant. Last updated August 1, 2017 . Much like the folks who call Los Angeles, New York or Chicago their home, the residents of Denver take great pride in their city but that doesn’t always mean they know everything about their city. Often it takes a visit from friends or family to inspire a tour of the town. This is where you get to see all the great sites for yourself and have a chance to fall back in love with Denver all over again. If you find yourself in the enviable position of playing tour guide this holiday season you might want to share a couple of interesting Denver facts with your visitors. The Denver international Airport is the largest airport in the country covering some 53 square miles. To make room for the airport construction crews had to level out 110,000,000 yards of earth. This is equivalent to about one third of the amount of dirt dug out to make the Panama Canal. For those who love to ride a bike or go for a job, Denver is an extremely inviting town with over 85 miles of pathways designated for their use. The bike paths link together 205 of the city’s parks. Speaking of paths, Colfax Avenue is the longest continuous street to be found anywhere in America. Denver also boasts 75 public and private golf courses as well as 25 world-class ski resorts that are all within 100 miles of driving distance of downtown Denver. When deciding what to pack to visit someone in Denver consider that the average winter temperature reaches a high of 37° while the average summer temperature can peek out at around 83°. Denver can also lay claim to being the inventor of the first cheeseburger. It was at the Denver Humpty Dumpty drive-in when owner Louis Ballast put a slice of cheese on a hamburger back in 1935 and started a whole new trend. There’s also a thriving business community that keeps Denver at the forefront of driving the state’s economic indicators. While many corporations have opted to make Denver their headquarters, it’s the small businesses and independent franchises that really keep the local economy bustling. The newest addition to this commerce community is Junk King Denver. Junk King Denver is part of a national franchise of dedicated junk haulers who make it their mission to keep their local communities clean from clutter. Unlike a day laborer who is a virtual stranger, a member of the Junk King Denver crew is someone who is licensed and bonded. These are the folks you call on when you want to clear out the junk from your home and make room for better uses. The Junk King crew will show up with a specialized truck to take away any amount of indoor or outdoor garbage you have accumulated, whether it be old and broken down furniture, antique appliances, ripped couches, dilapidated mattresses, fallen tree branches or any other type of junk you’ve accumulated over the years. Hiring Junk King to help you get rid of your stuff will not only let you reclaim valuable space in your home and it’s also a great way to support a small growing business in the Denver community. For the best in Denver Junk Removal, simply call 1-888-888-JUNK or book a free on site estimate today. This entry was posted in Denver Junk Hauling, Denver Junk Removal, Junk King Denver and tagged Denver Businesses, Denver Facts, Denver Junk Removal, Denver Small Business, Get Rid of Junk Denver, Junk Hauling Denver, Junk Removal Denver on December 23, 2011 by Paul Durant. Last updated August 1, 2017 .